Some items were provided for this post. All opinions are my own and I would only include them in here if I would actually add them to this gift basket. I have a few baby showers on my social calendar this spring. 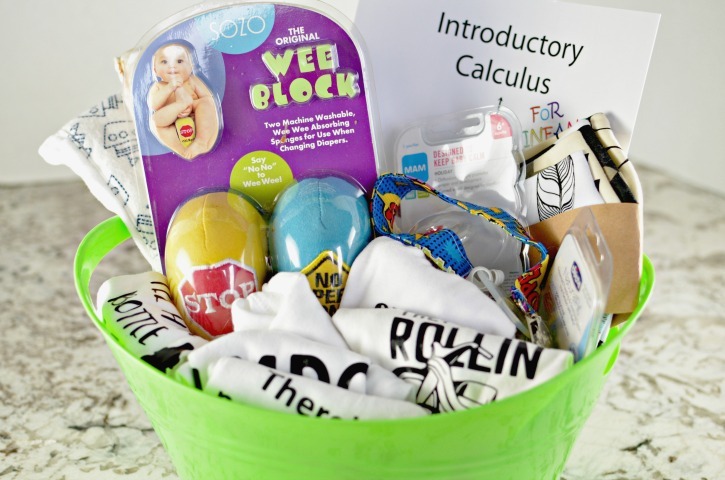 One of my favorite gifts for these showers is to put together a fun baby shower gift basket. 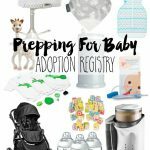 This is a great way to include a bunch of little items off the registry into a cohesive gift and can be made in a variety of price ranges. 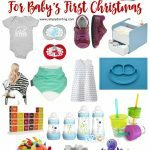 I’ve rounded up a few of my favorite items to include in these baby shower gift baskets and am sharing them with you below. 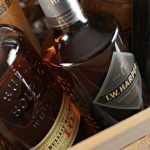 To put an awesome baby shower gift basket together, simply check out a few of the items below and create the perfect variety of items based on your budget. I like to get baskets from the dollar store (they have some great plastic totes and gift basket bags for wrapping). 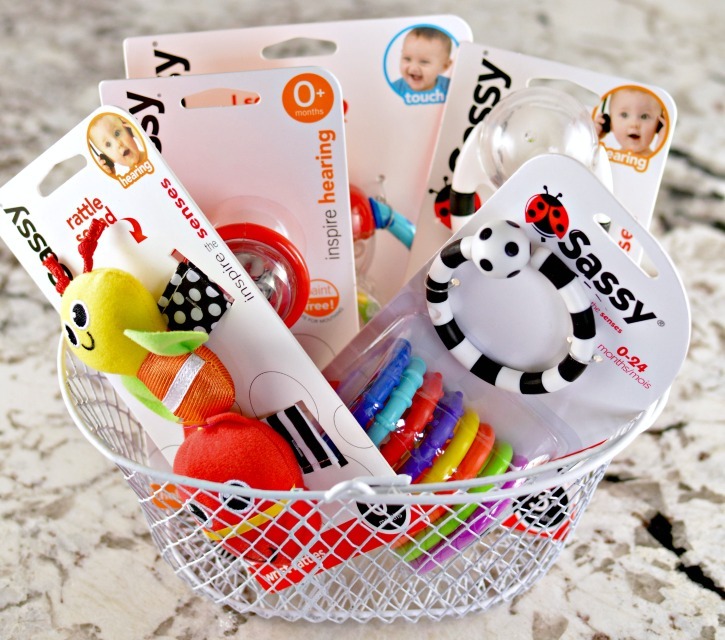 Sassy Rattle Gift Set – This gift set has so many great rattles! Sassy features toys which encourage open-ended play from the beginning. This gift set could be a gift in itself, or use it as a starting place to build the rest of the baby shower gift basket with the items below. Bandanna Bibs – Bandanna bibs are adorable, extra absorbent, and perfect for teething babies. There are so many fun patterns available and come in a variety of fabrics. 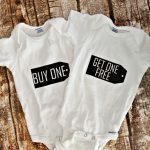 Funny Onesies – If you follow me on Instagram, you will see that I have a thing for fun onesies. I like to find the perfect funny onesie to match the parents and include it in the gift basket. Pacifier Clip – Once you find the perfect pacifier, you don’t want to lose it so keep it secured with a pacifier clip! Baby Socks – There is no such thing as too many baby socks, and if they are going to mostly be wearing socks without shoes, why not make them adorable ones like these animal themed ones. Pee-Pee TeePee – If the mom is pregnant with a boy, this pee-pee teepee is a must! Keep the parents safe from an unexpected shower. Head Bands – One of the fun things about having a girl is to dress them in adorable outfits and headbands. This set is great because it features a bunch of them in a variety of colors. BabyBum Diaper Cream Applicator – Because do you REALLY want to be touching that stuff with your fingers (and getting it under your nails)? Goodnight Moon Board Book – This book is a classic, and a board book is a nice heavy-duty surface to withstand many nighttime rituals. Boogie Wipes – Babies are messy, clean up their messy noses with some comfortable wipes. Burp Cloths – These burp cloths are nice and large so they can protect clothing from snot, puke, or spit-up. Do you have any baby showers you are attending soon? What sort of items are you gifting? This is so perfect- I was just invited to a baby shower yesterday! Sassy toys really are awesome to include – my babies both loved theirs. I love that “Ice Ice Baby” onesie! Such cute ideas for a baby shower!